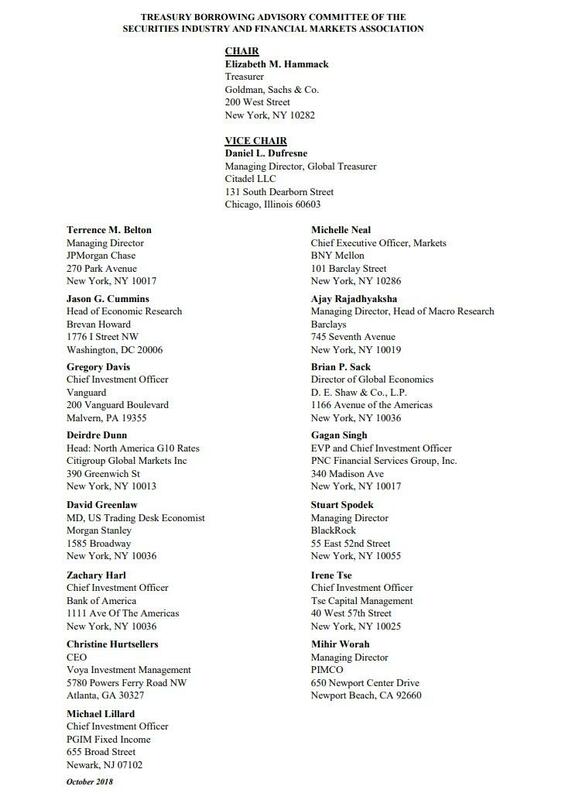 Today at 830am the Treasury Borrowing Advisory Committee (aka the TBAC, which many years ago we dubbed the Supercommittee That Really Runs America, an assessment which 8 years later Bloomberg now generally agrees with) "released minutes of its Jan. 29 meeting held at the Hay-Adams Hotel in conjunction with the U.S. government’s quarterly refunding announcement. First, the highlights from the refunding announcement revealed no surprises, with the Treasury announcing no increase in nominal coupon or FRN auction sizes in the coming quarter, and expects TIPS issuance of $22-27BN this calendar year. Specifically, the Treasury will sell $38BN in 3 Year notes, unchanged from December, $27BN in 10 Year notes, unchanged from last quarter, and $19BN in 30 Year Bonds, also unchanged from last quarter. In total, the Treasury will sell $84BN in long-term debt next week vs $83BN last quarter, in the process raising $29.9BN in new cash. The treasury also said that Bill supply will increase gradually and will start moderating in early-April, while confirming that extraordinary measures can be used after the March 1 debt ceiling deadline, while noting that it is too soon to say how long extra debt-cap moves will last. On the topic of the government shutdown, the TBAC members discussed the expected end of debt limit suspension period on March 1st, 2019 and agreed with former Chair Matt Zames’ statement that, “The debt limit should not be seen as a budget tool. It is simply a limit on Treasury’s ability to borrow to pay obligations that have already been incurred by Congress during the budget process.” In addition, the Committee noted sensitivity from one ratings agency due to the recent government closure. Though current uncertainty on the duration of extraordinary measures is high due to data availability, given the expected cash balance on March 1, 2019 will be significantly higher than in 2017, preliminary street estimates expect exhaustion of those measures in the third quarter of 2019. The TBAC also discussed the recent electronic inter-dealer broker market outage, noting that given the timing of the outage on a Friday afternoon, the impact on liquidity was muted. It was noted that had this happened in the morning, around an auction or key economic release, the impact would likely have been far greater. While all of the above was protocol, the most interesting part of the TBAC minutes was the discussion of the "unique challenges" faced by the Treasury over the medium term, especially the possibility of significant financing gap over next 10 years amounting to over $12 trillion and the potential need for more domestic investor participation if foreign reserve growth slows. Specifically, the TBAC cautioned that the Treasury’s financing needs are expected to increase significantly even without factoring in recession possibilities over the next decade. Here, the TBAC warns that deficits to the tune of $1-$1.5trn a year, and cumulatively over $12trn, over the next decade, are coming and will have to be funded in the bond market. Meanwhile, as noted recently, the CBO stubbornly refuses to forecast a recession in the next decade, instead projecting a steady 1.5-2% real GDP growth over the next 10y. While the TBAC did not take a position on this laughable assumption, it warned that deficits typically rise 2-5% of GDP in recessions, which would translate to additional deficits of $0.5-1trn at current GDP levels, and warns that "these borrowing needs have to financed in the context of already high global dollar debt exposure." 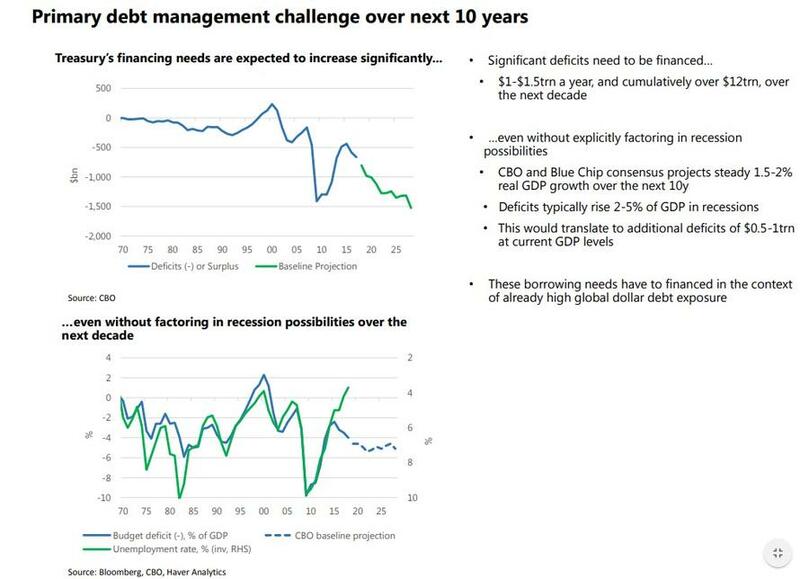 But the bigger problem is that in the context of soaring deficit funding needs, the TBAC is worried that "foreign investors already hold significant dollar debt" which is why the US will have to increasingly rely on domestic savings to fund its future budget deficits. 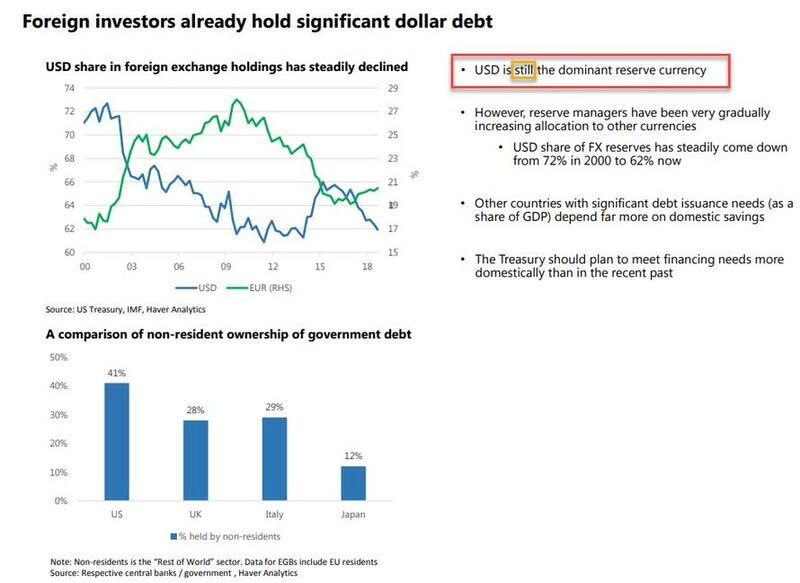 The TBAC notes, tongue in cheek, that while the "USD is still the dominant reserve currency", reserve managers have been very gradually increasing allocation to other currencies, and that the USD share of FX reserves has steadily come down from 72% in 2000 to 62% now. It also pointed out that other countries with significant debt issuance needs (as a share of GDP) depend far more on domestic savings. As a result, "the Treasury should plan to meet financing needs more domestically than in the recent past." 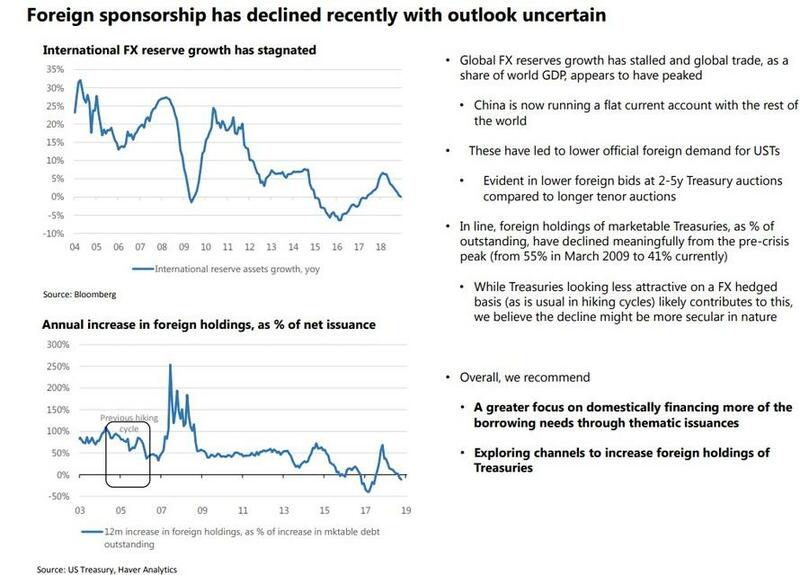 Even more concerning, the TBAC notes, is that global FX reserves growth has stalled and global trade, as a share of world GDP, appears to have peaked, while underscoring what may be the most important transition in the global economy in decades, namely that China is now running a flat current account with the rest of the world, something we discussed extensively in "A Tectonic Shift In China's Economy Has Largely Gone Unnoticed By Investors." And while the TBAC admits that Treasuries look far less attractive on a FX hedged basis, something we also discussed recently, which is likely contributing to this decline in foreign demand, the TBAC believes "the decline might be more secular in nature." The TBAC also recommended several new bond type products, such as longer tenor (3Y and 5Y) FRNs, SOFR-linked FRNs, the issuance of 15 and 20 Year securities to "benefit from demand in the sector", the issuance of "Perpetual Horizon debt" (noting that 14 OECD countries have issued ultra-long bonds with 40-100y maturities. 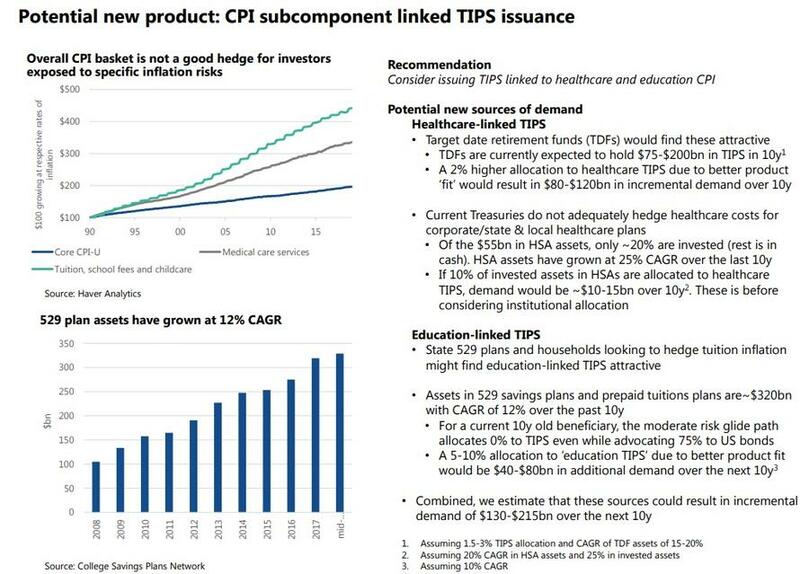 Austria, Belgium and Ireland have issued 100y bonds in the past 2 years), and zero coupon issuance, but the most interesting recommendation: to launch a new product such as CPI subcomponent linked TIPS issuance, such as TIPS linked to healthcare and education CPI. ... which appears to be increasingly concerned not only about how the US will fund its exploding debt deficits but also about the reserve currency status of the US Dollar.